Sorry everyone. I really dropped the ball this time. I recently got a new computer and when transfering over all the files, I managed to lose/misplace the entire Surrealism set that I was making. 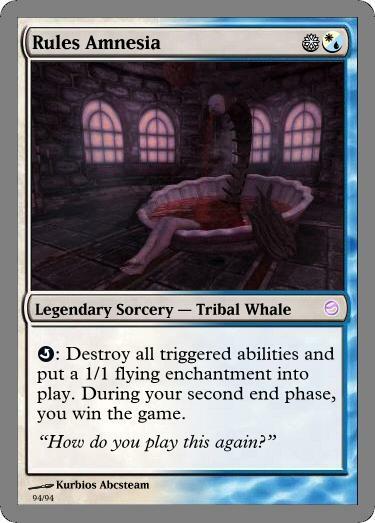 As a somewhat bonus, I did manage to upload to one joke card that I had made because I wanted something to never die, and become the "I win." card that Progenetus wanted to be. Also because I figured out you could do tri-color mono-hybrid symbols which I thought/still think that will show up in the newest set: Return to Ravnica. Well. I'll get back to try to find the file, and hopefully next week I will be putting up MUCMondays again. Worst case scenario, I have to make an entirely new set. Which actually isn't that bad. When Yup is cast, any player may have their life total become zero. If they do, exile Yup. 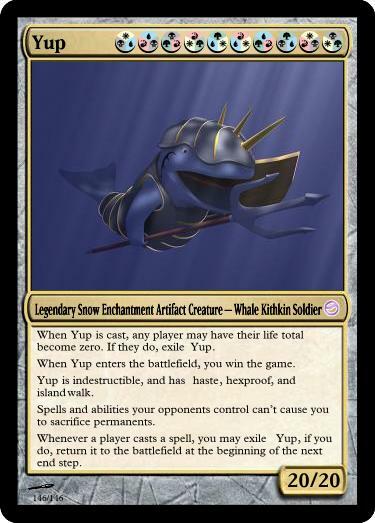 When Yup enters the battlefield, you win the game. Yup is indestructible, and has haste, hexproof, and islandwalk. Spells and abilities your opponents control can’t cause you to sacrifice permanents. Whenever a player casts a spell, you may exile Yup, if you do, return it to the battlefield at the beginning of the next end step. I hope no card like this will ever be printed. Ever. I'm still fairly mad that Blightsteel Colossus even exists. There should be a creature that one-hits player. It just shouldn't exist. It also somehow seems broken if you don't cast it, but just put it onto the battlefield by say Quicksilver Amulet, Elvish Piper, or Tooth and Nail. Once again SCS apologizes on missing two MUCMondays in a row, and I'll get right on finding that file.